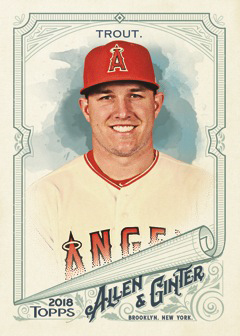 2018 Topps Allen & Ginter Baseball has all the elements the brand is known for including an antique look, framed hits and Rip cards. 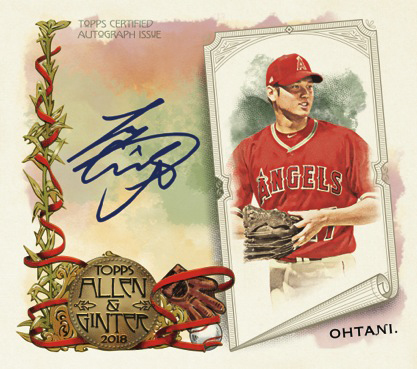 But even in that familiarity, Topps is spicing things up–literally. Sticking with tradition, hobby boxes have three hits that can include anything from autographs to memorabilia cards to original Allen & Ginter cards or Rip cards. A total of 350 cards make up the 2018 Topps Allen & Ginter Baseball base set. Of those, the final 50 are short prints. And while those 50 cards may be a little tougher to come by, one lands every other hobby pack. That means they definitely attainable. The checklist is predominantly baseball players past and present, but this wouldn’t be a modern Allen & Ginter set without some cards from outside the sport. The brand celebrates champions from other sports and areas of a much broader pop culture. Full-sized parallels come in a couple of forms. Hot Box base cards return for another year. These are available only in randomly inserted boxes. One-of-one Glossy parallels also return. These are just the start of the parallels, though. Every pack also has a mini parallel. These come in several forms beyond the basic shrinking of a base card to match original tobacco card dimensions. A&G Logo Back Minis are 1:5 packs while Black Border Minis are 1:10. If you find a mini card without a number on the back, it’s by design. No Number Minis have just 50 copies each. Sequentially numbered mini parallels include Brooklyn Logo Back (/25), hobby-exclusive Wood Stock (1/1), Glossy Stock (1/1) and Framed Printing Plates (1/1). Framed Cloth Cards (/10) and Metal Minis (/3) are partial parallels of 150 cards. Both of these are found only in hobby packs. The Framed Mini Autographs in Allen & Ginter are, traditionally, some of the most popular in the entire hobby. 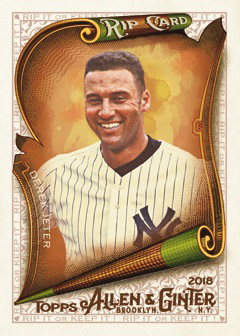 So, of course, they return in 2018 Topps Allen & Ginter Baseball. The checklist is fairly large, covering more than 50 baseball players and champions from other areas. Autograph parallels include Black Framed (/25) and hobby-exclusive Red Ink. A small number of Cut Signatures are in the product covering figures from history and politics. These are all one-of-ones. 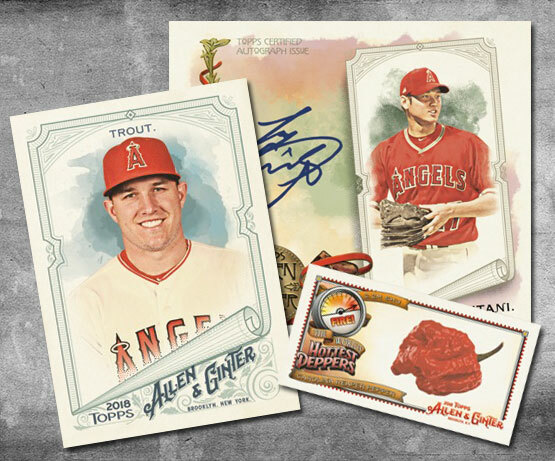 Basic memorabilia cards in 2018 Topps Allen & Ginter Baseball come in two forms, Full-Size Relics and Framed Mini Relics. The Full-Size Relics checklist is the larger of the two, bringing in the eclectic range of baseball players, pop culture personalities and champions. The product has single and dual Autograph Relic Book cards. Numbered to 10, single versions have a signature and memorabilia from one star. Duals double it up, highlighting a pair of players. Framed Sunken Treasure Relics head to the bottom of the world’s oceans and seas. These are only in hobby packs. Going back to the early days of trading cards and the Allen & Ginter brand are Framed Originals. A total of 100 antique Allen & Ginter tobacco cards are in the product, inserted into a custom frame. Each of these is considered to be one-of-a-kind. Rip cards and hobby-exclusive Double Rip cards return at a rate of two total per hobby case. These have a card within the main card, creating a collector’s dilemma. Do you tear the outer card to get to the one that sits within? Or do you keep it in tact and in top condition? Among the contents of the Rip cards are 50 exclusive Mini cards that expand the checklist to 400 cards. These do not have full-sized versions. They’re also not available in packs as loose cards outside the Rip cards. Rip-exclusive minis come with Metal (/3) and Wood (1/1) parallels. Be warned, Allen & Ginter isn’t all baseball. This is where things get a little bit strange and fun. Full-sized inserts combine to land 1:2 packs. Two of these are rather large. World Talent has 50 cards and looks at players in the majors from around the globe. Also coming in at 50 cards is Fantasy Goldmine. These celebrate players who bode well with sabermetric stats. Other regular inserts include Baseball Equipment of the Ages (30 cards), World’s Greatest Beaches (ten cards) and Magnificent Moons (ten cards). In addition to the traditional-sized inserts are several mini inserts. Themes are extremely varied, starting with Baseball Superstitions (15 cards). Non-baseball mini inserts cover an extremely varied area of topics. World’s Hottest Peppers bring the literal spice to the checklist. Postage Required (15 cards) celebrates stamps. Flags of Lost Nations (15 cards) remember national symbols that are no more. Indigenous Heroes (25 cards) celebrate some of history’s greatest Native American and First Nations leaders in North and South America. Finally, there’s Folio of Fears (ten cards), dedicated to the things many of us are scared of. Every 2018 Topps Allen & Ginter Baseball hobby box comes with one over-sized box loader card. Basic box loaders feature top players and rookies. Autograph Box Loaders come numbered to 15 copies each. N43 Box Loaders take a throwback look to key stars. These have 500 copies.Autographed versions for select players are numbered to 15. Going outside of baseball are Natural Wonders Box Loaders. Limited to 500 copies each, these look at amazing places in the world.